This Norman Rockwell Christmas painting was the 204th published Norman Rockwell Saturday Evening Post cover. Rockwell's career with the Post spanned 47 years, from his first cover illustration, Boy With Baby Carriage in 1916 to his last, Portrait of John F. Kennedy, in 1963. This was also the sixth Rockwell Post cover of 1941. This painting also appears in two Rockwell commentary books. It appears as illustration 251 of Norman Rockwell's America by Christopher Finch and on page 137 of Norman Rockwell, A Definitive Catalogue by Laurie Norton Moffatt. Here is another atypical Christmas scene from Norman Rockwell. 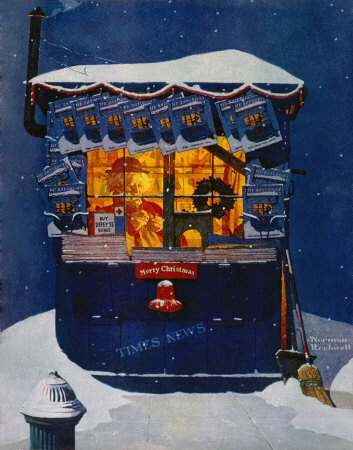 One does not usually think of a news kiosk as being the subject of a Christmas scene. And this is not one of Rockwell's strongest efforts as either a Post cover or a Christmas painting. Nevertheless, the painting still has real interest to the astute eye. The painting's apparent simplicity is dismissed when you consider that all the Saturday Evening Posts that are for sale on the newstand are exact replicas of the issue that the reader is looking at. This is one of the few times Rockwell painted an illustration that used this storytelling technique. We can also see different publications inside the newstand, but the Post is what took the forefront. And rightly so. After all, this painting was published on the cover. The other details of the painting are interesting as well. The sidewalk has been shoveled and swept clean of the snow that is piled everywhere around. We can see both the snow shovel and the broom leaning against the side of the shop. A sign in the window of the newstand urges the reader to "BUY DEFENSE BONDS." A red "Merry Christmas" sign hangs from the front of the store with a red snow covered bell underneath. It hangs just above the name of the news kiosk, "TIMES NEWS." We are able to see how the older lady working inside manages to stay comfortable in all the cold. First off, she still wears her coat and hat inside. It looks as if she still wears her gloves also. We can also see the stovepipe exiting the shop on the left side of the picture and als see it descending at a diagonal twoard the right side. The stovepipe probably emanates heat its entire length through the store from the stove on the right side to its exit on the left side. Every bit of heat helps when you are working in the middle of this much snow.